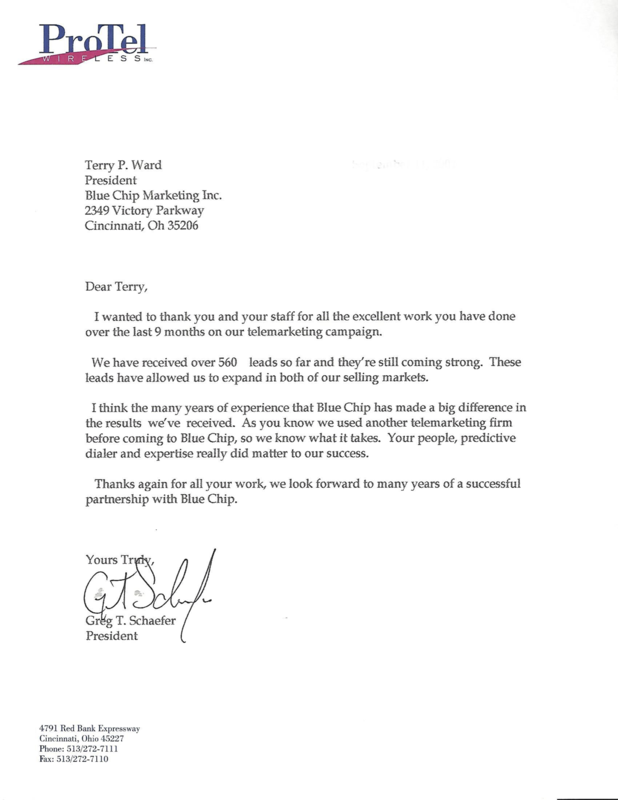 It has been a pleasure working with Blue Chip Marketing. We were very pleased with the results of our first telemarketing campaign, and looking forward to kicking off our next one. As you know, we had never used telemarketing for lead generation. I found you and your staff to be very knowledgeable and helpful in education us on the process and more importantly, in generating results. I appreciate the flexibility and professionalism of your services. 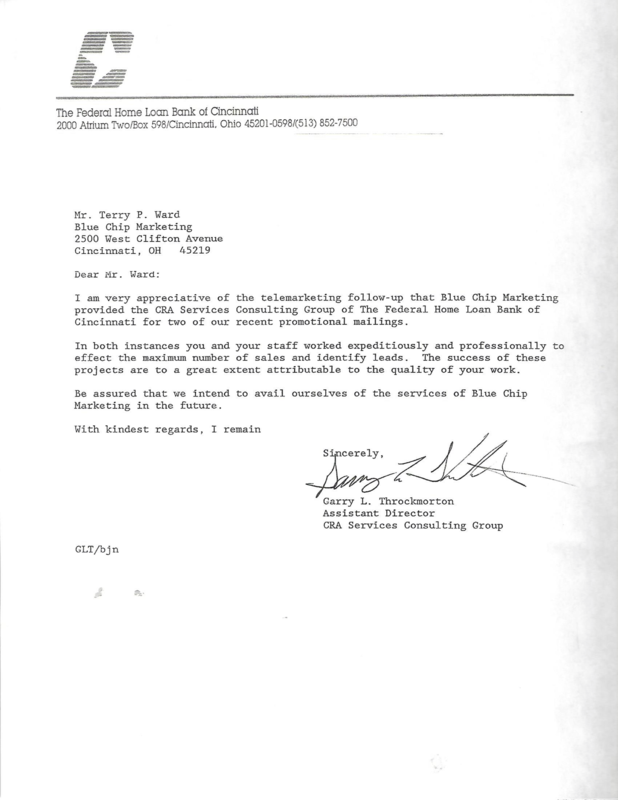 I am very appreciative of the telemarketing follow-up that Blue Chip Marketing provided the CRA Services Consulting Group of The Federal Home Loan Bank of Cincinnati for two of our recent promotional mailings. In both instances you and your staff worked expeditiously and professionally to effect the maximum number of sales and identify leads. The success of these projects are to a great extent attributable to the quality of your work. Be assured that we intend to avail ourselves of the services of Blue Chop Marketing in the future. 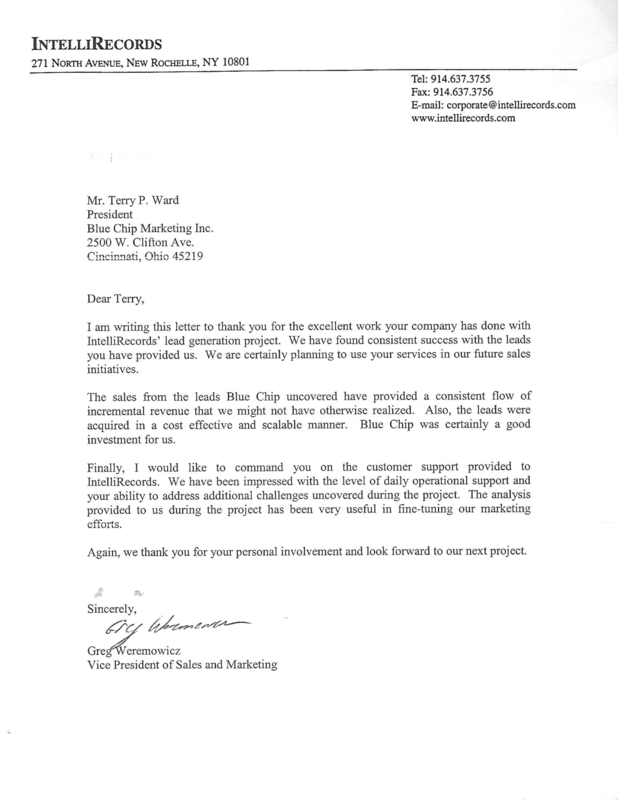 Blue Chip Marketing performed all of the telemarketing tasked requesting of it by the Postal Service in a timely and efficient manner. They went out of their way to be accommodating in securing the necessary supplies for the program. 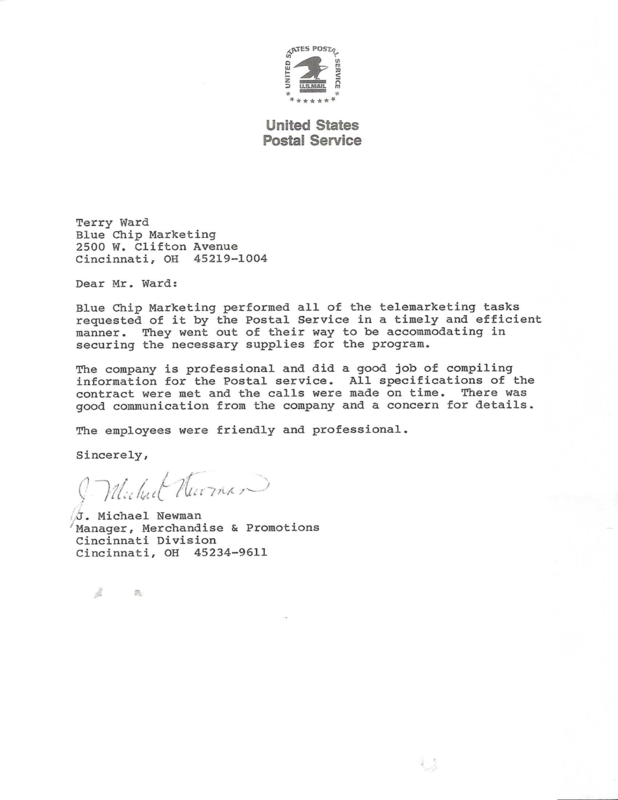 The company is professional and did a good job of compiling information for the Postal Service. All specifications of the contract were met and the calls were made on time. 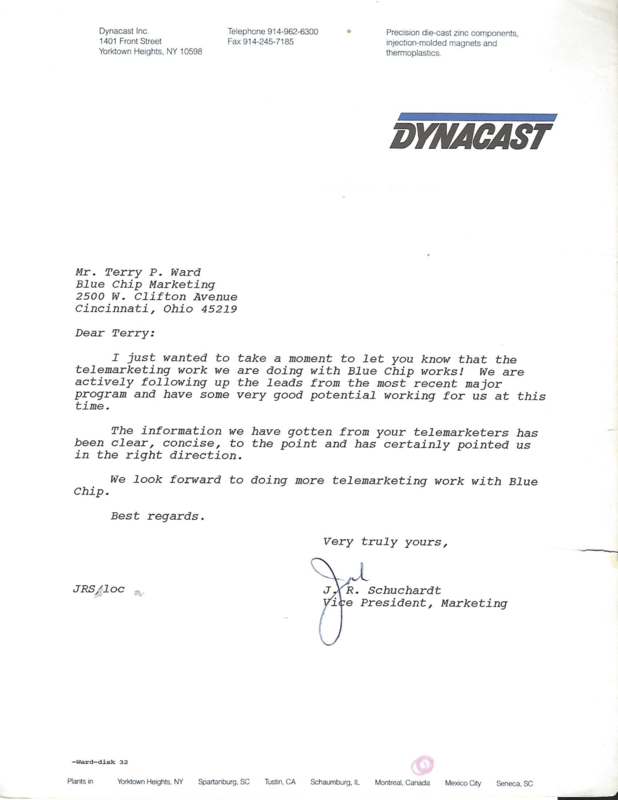 There was good communication from the company and a concern for the details. I wanted to write you to commend Blue H=Chip Marketing for the fine work done on our various telemarketing projects this year. Our Account Executives have consistently expressed enthusiasm for the quality of leads they receive. Form a project management perspective, we have found your company to be reliable and responsive to our needs. Most importantly, your information systems capabilities have enabled us to capture valuable data generated in the course of telemarketing and to construct a new prospect tracking system that will enhance out sales productivity. 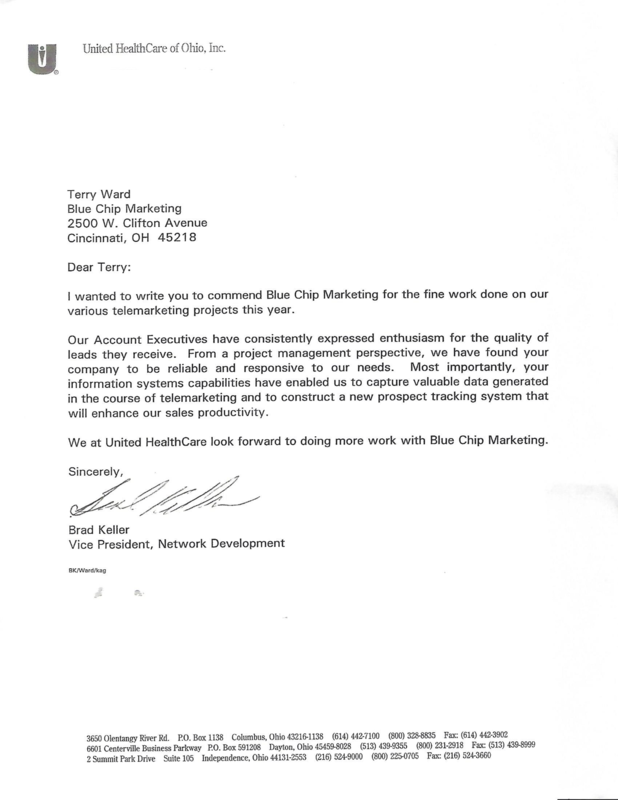 We at United HealthCare look forward to doing more work with Blue Chip Marketing. We have been working together now for twelve months, with much success I might add. I want to express my sincere appreciation to you and your staff for the courteous and professional manner in which our needs have been handled. As you are aware this campaign began as we were developing a network to respond to an RFP, through your handling of incoming calls and providing follow-up calls to the targeted network we were successful! We were awarded the contract in September of this year, we certainly feel that our strong network set us aside from our competition. Thanks to you and your staff for all your hard work in assisting me with this endeavor. After using your company for our initial campaign, it was an easy decision to decide with whom we wanted to continue to team up as we continued our network development process. I will continue to recommend your company to others within this corporation as well as outside. Best wishes for the future. Our website, www.milpro.com, is live; and I just wanted to let you know what a big help everyone on our team at Blue Chip has been. Carolyn Pearre has become a trusted part of our business. She has done a super job in the setup of our unique customer services arrangement, and she has been flexible with every strange request or need that we have had. Carolyn has made herself available to me and my team day or night. I feel that Carolyn always does her homework and makes every effort to make our business a success. Heidi Stephens has been consistent and thorough throughout the implementation of our project, She generates great ideas, and she has been incredible proactive in dealing with issues. Nancy and Aubrey have been great additions to the team. They have been very professional in various circumstances, and I look forward to working more with them in the future. Terry, you have a super team; and we sincerely enjoy working with them. 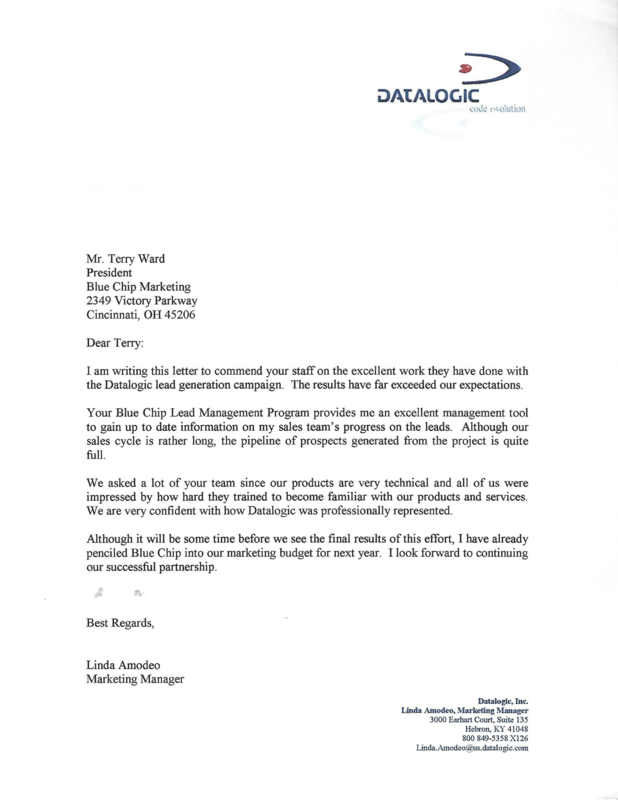 I am writing this letter to thank you for the excellent work your company has done with IntelliRecords' lead generation project. We have found consistent success with the leads you have provided us. We are certainly planning to use your services in our future sales initiatives. The sales from the leads Blue Chip uncovered have provided a consistent flow of incremental revenue that we might not have otherwise realized. Also, the leads we acquired in a cost effective and scalable manner. Blue Chip was certainly a good investment for us. Finally, I would like to command you on the customer support provided to IntelliRecord. We have been impressed with the level of daily operational support and your ability to address additional challengers uncovered during the project. The analysis provided to us during the project has been very useful in fine-tuning our marketing efforts. Again, we thank you for your personal involvement and look forward to our next project. I wanted to thank you and your staff for all the excellent work you have done over the last 9 months on our telemarketing campaign. WE have received over 560 leads so far and they're still coming strong. These leads have allowed us to explain in both our selling markets. 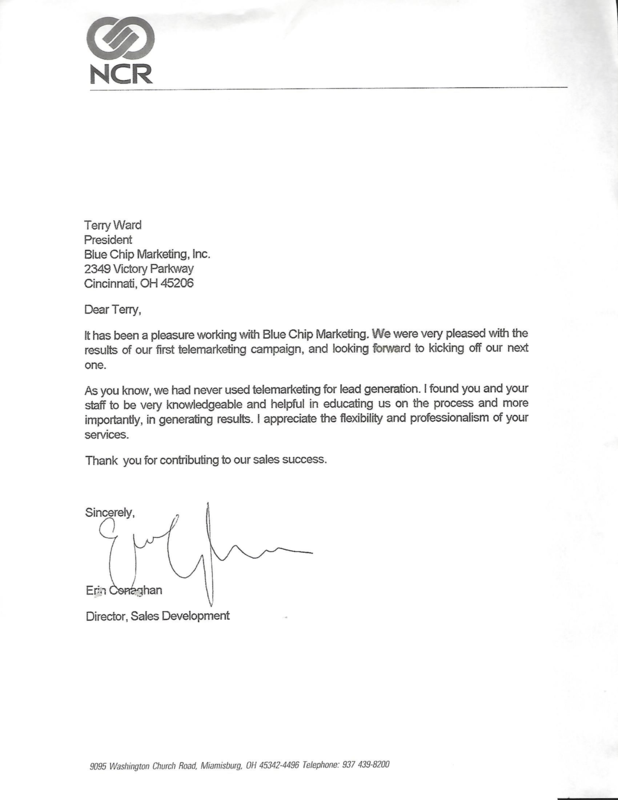 I think the many years of experience that Blue Chip has made a big difference in the results we've received. As you know we used another telemarketing firm before coming to Blue Chip, so we know what it takes. Your people, predictive dialer and expertise really did matter to our success. Thanks again for all your work, we look forward to many years of a successful partnership with Blue Chip. I am writing this letter to comment your staff on the excellent work they have done with the Datalogic lead generation campaign. The results have far exceeded our expectations. Your Blue Chip Lead Management Program provides me an excellent management tool to gain up the date information on my sales team's progress on the leads. Although our sales cycle is rather long, the pipeline of prospects generated from the project is quite full. We asked a lot of your team since our products are very technical and all of us were impressed by how hard they trained to become family with our products and services. We are very confident with out Datalogic was professionally represented. Although it will be some time before we see the final results of this effort, I have already penciled Blue Chip into our marketing budget for next year. I look forward to continuing our successful partnership. What started our as just another telemarketing campaign has blossmed into a tremendous sales and marketing tool that our company now finds to be invaluable. Please thank everyone at Blue Chip on our behalf for all their efforts. Our initial concerns of trusting medical product research and representation to Blue Chip have been replaced by requests from our sales force at our national meeting...when I asked what marketing could done for them, they unanimously responded with "more Blue Chip marketing." Your services were more important to them than new products, new literature, and competitive information. Based on your daily faxes to us, our reps receive customer products request, complaints, and in-services opportunities that are only hours old. Aside from the new sales that you have generated for us, our customers have commented on the excellent job that we are not doing in servicing their needs. That, combined with the sales rep's ability to schedule productive appointments rather than waste time prospecting is why we did seven projects with you in 1992. As you know, we were originally budgeted for bringing telemarketing in-house in 1992. Based on your performance, the quality of your operation and predictive equipment, and your very reasonable pricing, Libel-Flarshiem can no longer justify the start-up of our own telemarketing operation. 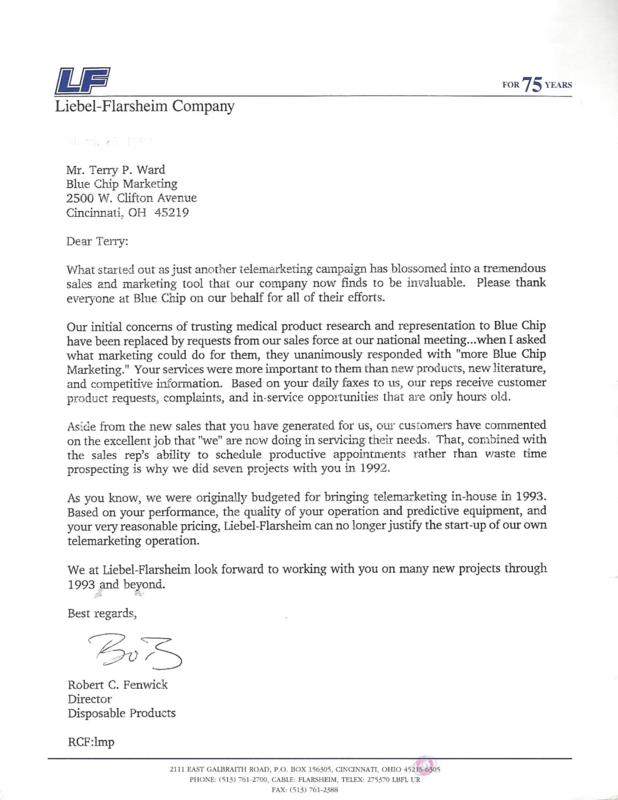 We at Liebel-Flarshiem look forward to working with you on many new projects through 1992 and beyond. I wanted to commend you and your company for the excellent service provided to Copper and Brass Sales over the last five years. From our first experience in meeting with Blue Chip through the completion of the program, I was always impressed with the professional attitude of your employees and their willingness to work with me to achieve the best results. I truly felt that the people at Blue Chip approached each survey call with the intent of collecting the most accurate information possible. It was very reassuring to work wit ha firm who recognized the value of providing good market research data in the business-to-business field, and your recommendations on everything from the survey set up to the reports were right on the money. Over the years, I have been able to use the monthly data reports on many instances with my internal clients. 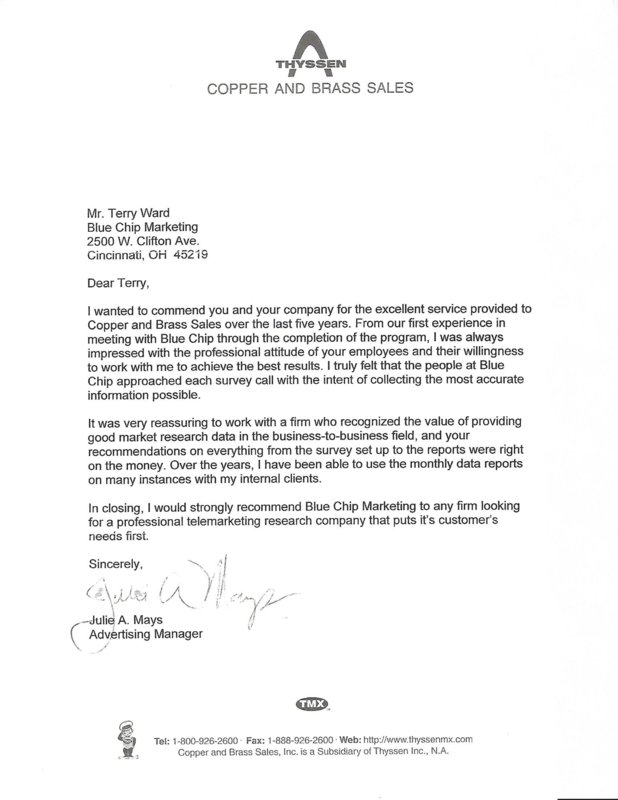 In closing, I would strongly recommend Blue Chip Marketing to any firm looking for a professional telemarketing research company that puts it's customers's needs first. I just wanted to take a moment to let you know that the telemarketing work we are doing with Blue Chip works! We are actively following up the leads from the most recent major program and have some very good potential working for us at this time. The information we have gotten from your telemarketers has been clear, concise, to the point and has certainly pointed us in the right direction. We look forward to doing more telemarketing work with Blue Chip. 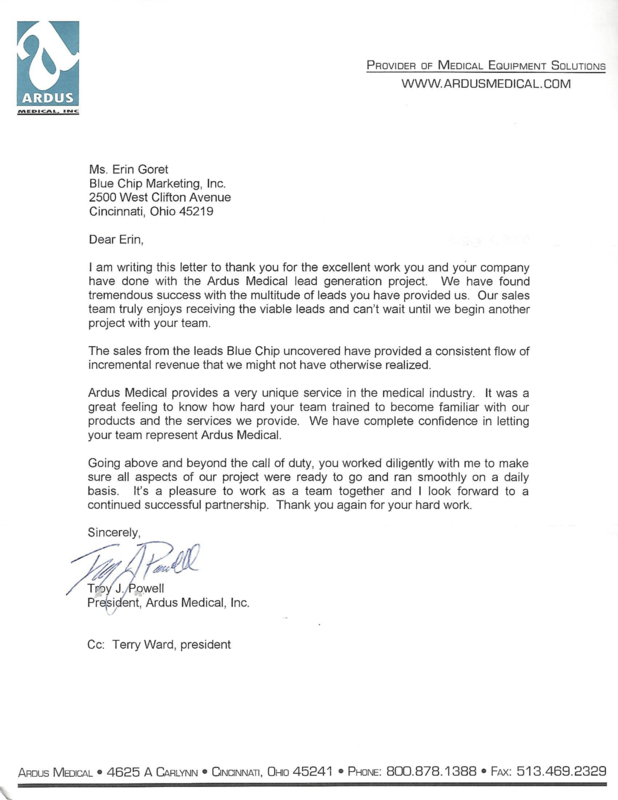 I am writing this letter to thank you for the excellent work you and your company have done with Ardus Medical lead generation project. We have found tremendous success with the multitude of leads you have provided us, Our sales team truly enjoys receiving the viable leads and can't wait until we begin another project with your team. The ales from the leads Blue Chip uncovered have provided a consistent flow incremental revenue that we might not have otherwise realized. Ardus Medical provides a very unique services in the medical industry. It was a great feeling to know who hard your team trained to become familiar with our products and the services we provide. We have complete confidence in letting your team present Ardus Medical. Going above and beyond the call of duty, you worked diligently with me to make sure all aspects of our projects were ready to go and ran smoothly on a daily basis. It's a pleasure to work as as team together and I look forward to a continued successful partnership. Thank you again for your hard work.